I added to my stash this week. Each one has a home waiting for it! 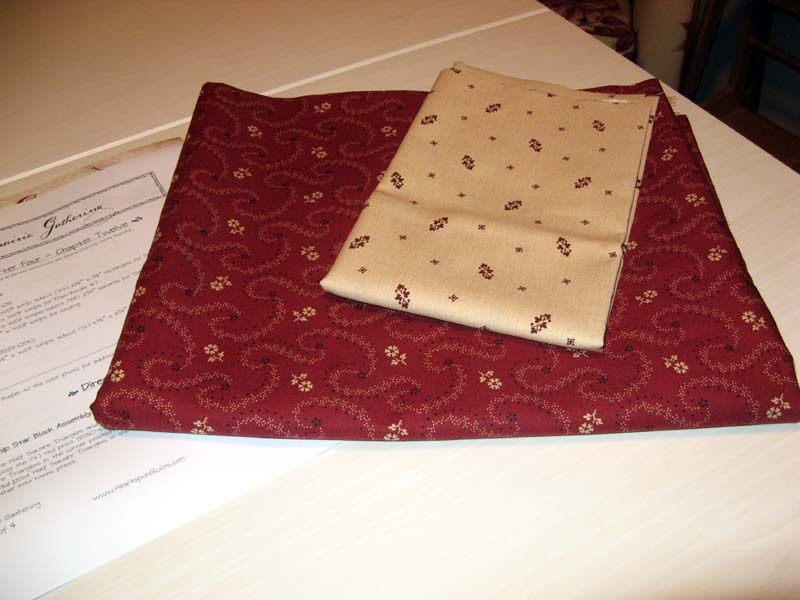 The first one is fabric from Chapter 12 BOM for Kanton Kull (A Prairie Gathering) that has yet to be started. 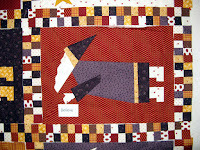 January I'll be sewing Chapter 1; hoping that Kerry can keep up. These two are for Katchaklaus (Believe) on the bottom and Kontentment (Allietare Mystery) on the top. 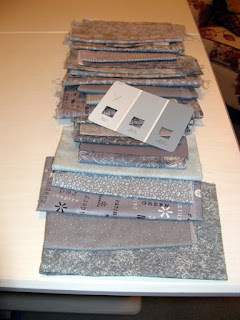 I needed a bit more for the back of Katchaklaus and the gray is the constant gray that I just couldn't come up with in my stash. 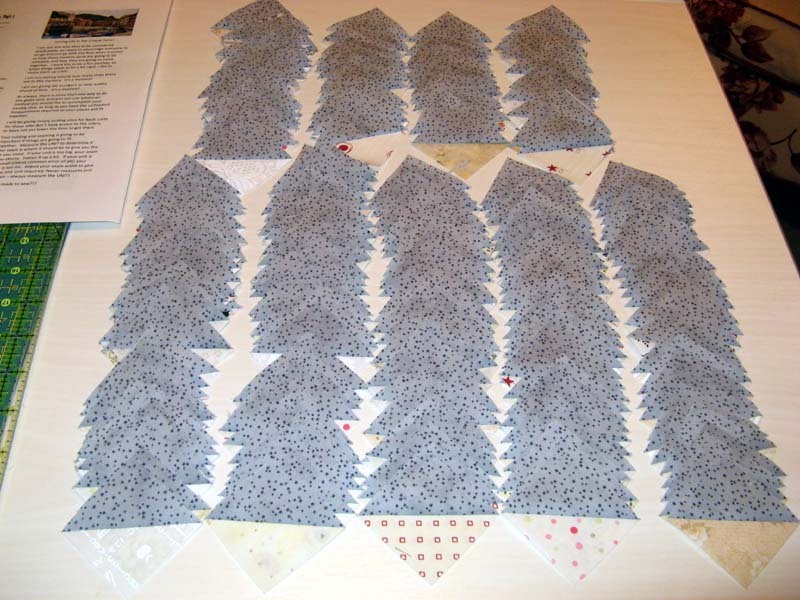 I'll be using the gray for Clue 1 today along with the neutral to make 294 2" HSTs. This last piece is the red I picked up for Krystals (Snowy Day). I have already used it as you can see in the photo below for the border. Yes, there are several yards of adds, but already there is a usage! Have fun this week. 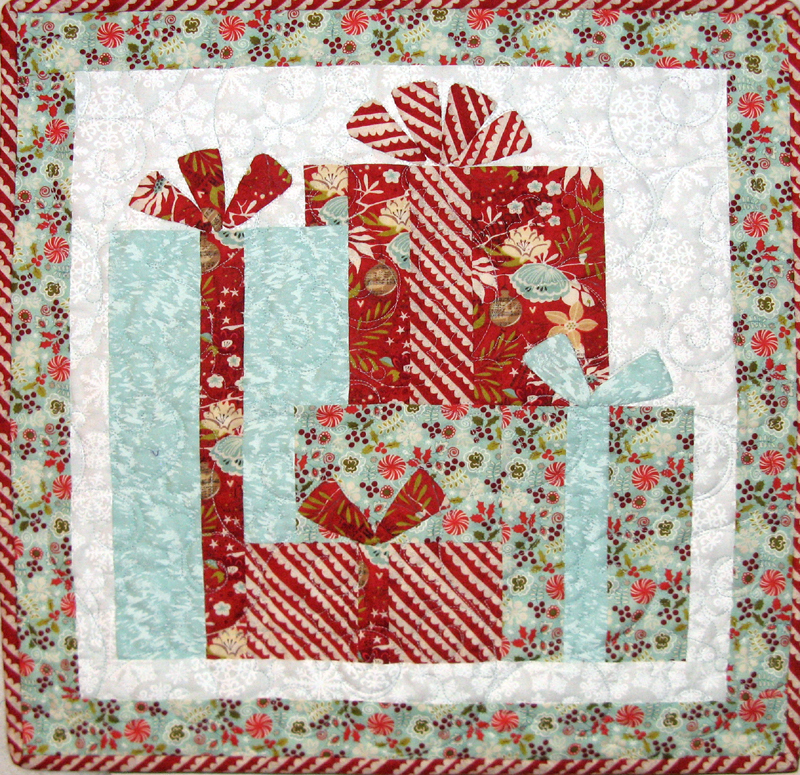 Down with the Fall decorations and up with Christmas... See how others use their stash through the links at Patchwork Times. 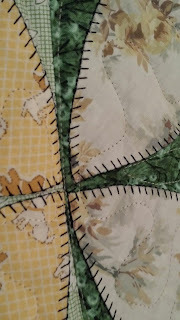 I have the piecing all done now. 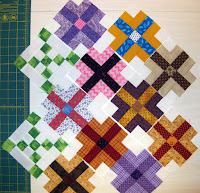 Time for putting the rows together, but that won't be likely be until Friday. I have lots of cooking to do tomorrow and family coming by to share Thanksgiving Day. Krystals will be a nice addition to my Christmas decorations. 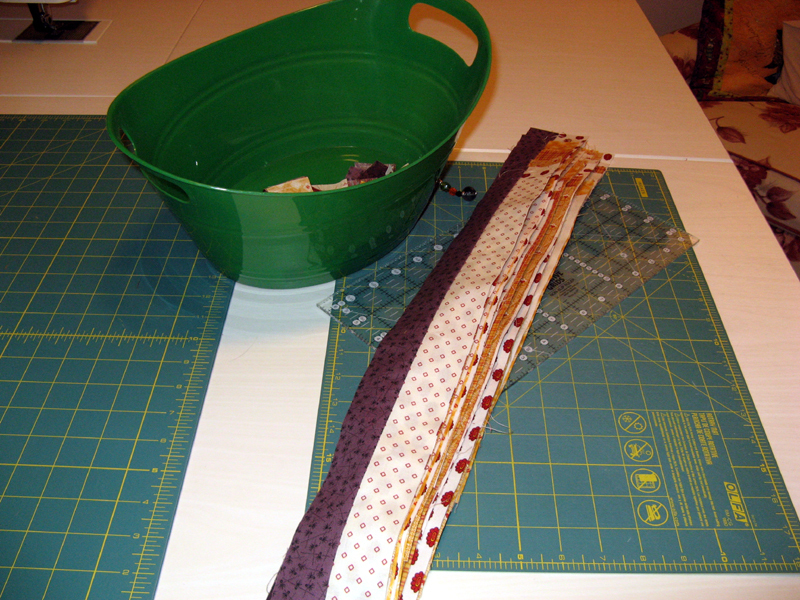 My version is significantly smaller than the pattern. 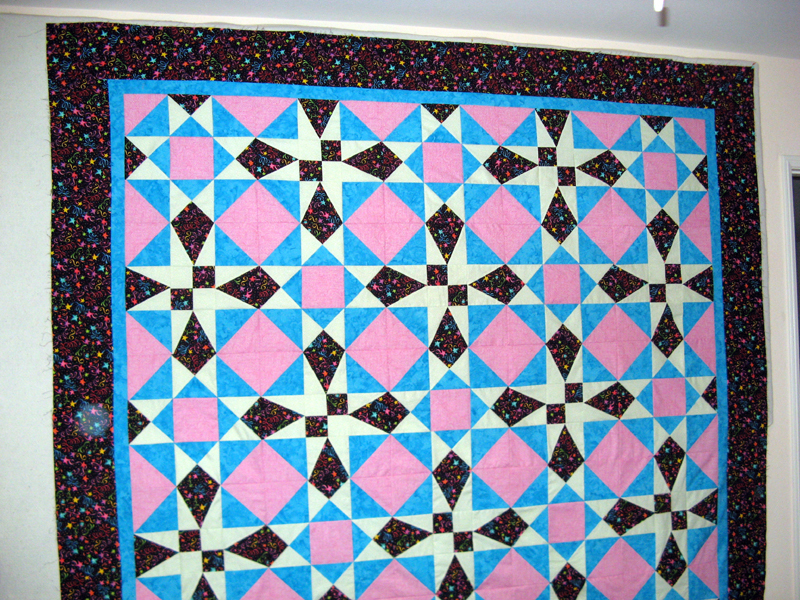 My blocks finished at 5 1/2" square where the pattern called for 12 1/2". I will be picking up a solid red fabric for an outer border and considering the stripe as a diagonal binding. 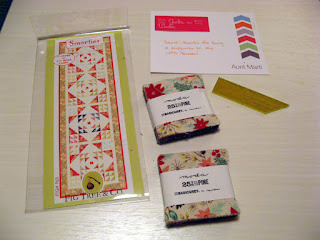 Bonnie Hunter's Allietare Mystery Clue 1 is released Friday. 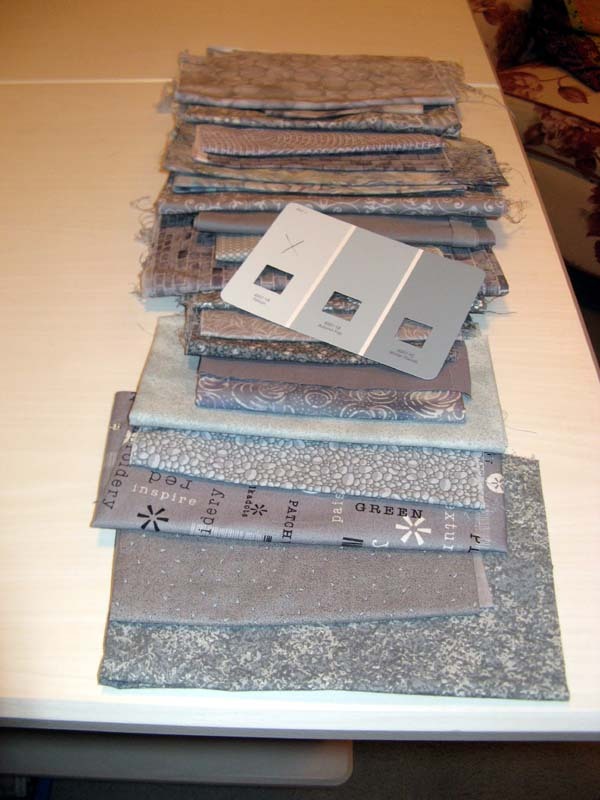 I need to pick up 1 1/2 yards of the constant fabric, a gray. The largest piece in my stash is 1 yard. Hope you enjoy your Thanksgiving Day celebration. 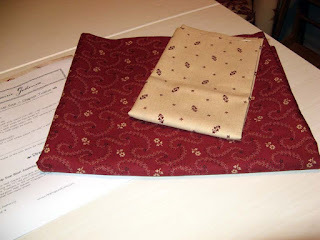 I have started to pull fabrics for Bonnie Hunter's Allietare Mystery. Have you? 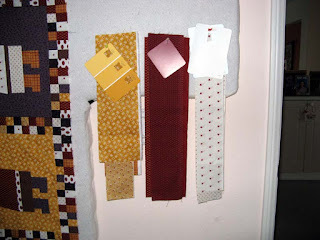 Several of the leftovers from Katchaklaus will be used along with a bunch more I still need to hunt for in my stash. 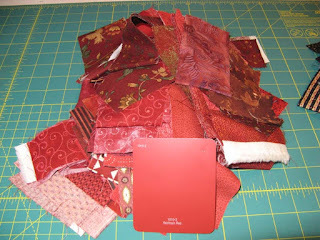 I may have to raid Kerry's stash of reds; she has lots of them. I'll likely assist her with grays. As I remember she's a bit light on them. I have a good assortment of both blacks and grays. 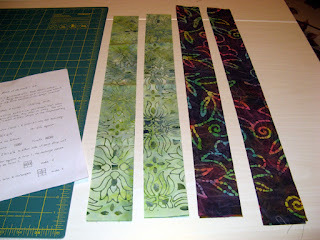 Hope to use some of my cut strips, but until I know the sizes of the pieces no sense to look. I have already decided on a name for my project. Kontentment sounds right considering the meaning of Allietare. What do you think? Part of this week goes to cooking. DH's family will join us on Thursday. We brought home the turkey on Saturday along with potatoes, fresh vegetables, and stuffing mixes. I have to make a list yet of other items to have on hand for our feast. Have a wonderful Thanksgiving everyone. 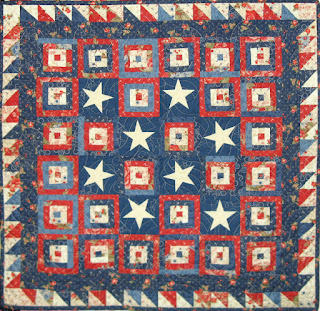 More to look at through the links at Patchwork Times. These two blocks are for Sunshine Quilt Guild BOM that Karen is organizing for the month. I'm ahead of schedule getting these done, but I know all too well how time sometimes creeps up on us. I was provided the green batik. 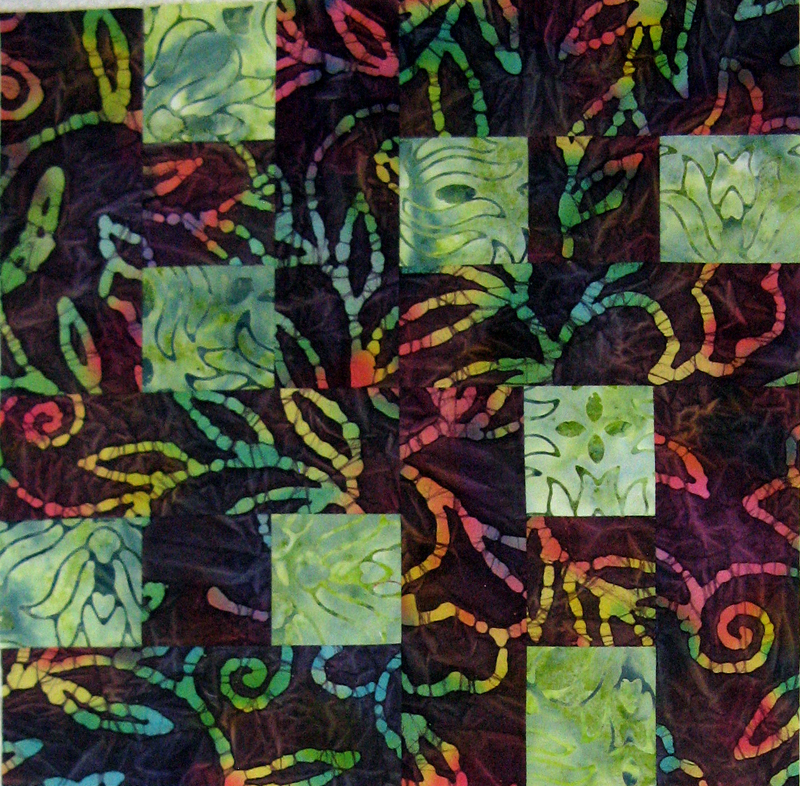 The multi color batik worked well with the green. 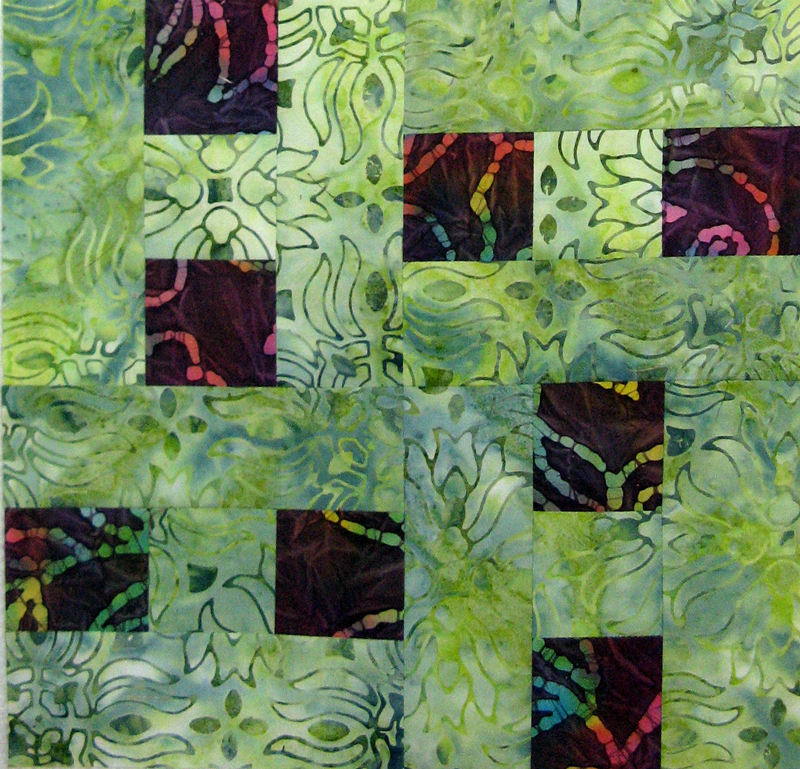 These blocks are components of Garden Party by Bonnie Hunter. They will go into the Sunshine Opportunity Quilt for 2017. Now that's planning...good on Cristy and Theresa. These are parts of Katchaklaus that is Believe! by Buggy Barn. Nancy, I find so much fun saying this projects name! I have three holding gold stars and one a red star. As you can see I figured out how to get my new Pfaff to stitch out the alphabet. It really was much easier than I would have ever though it could be. 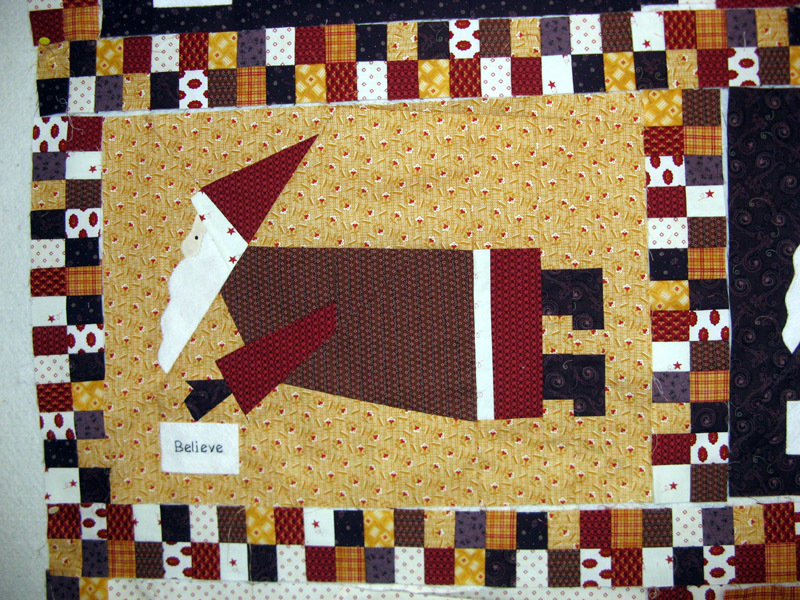 There are eight holding a Believe sign. 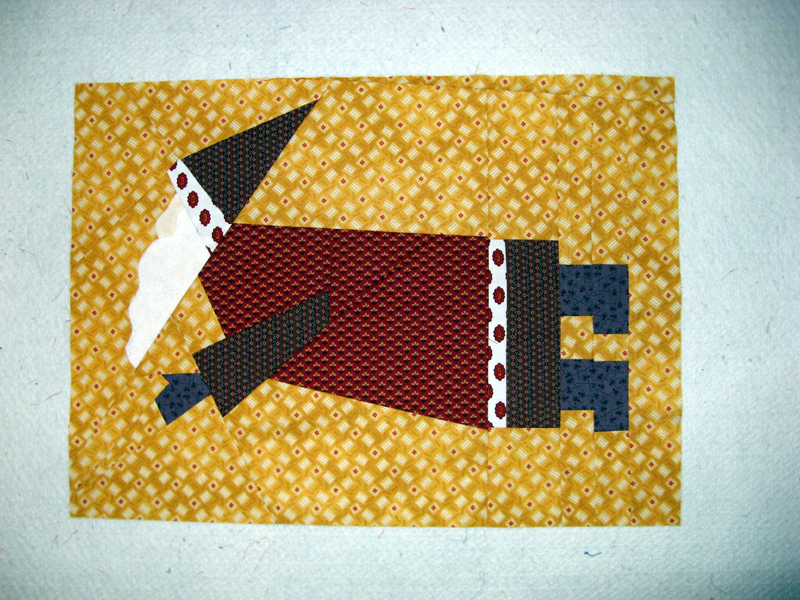 It really is hard to pick a favorite "flying Santa". 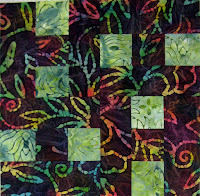 Until next time enjoy the links of others using their fabric stash through the links at Patchwork Times. Katchaklaus is moving right along. I have two more 64 piece unit sashings yet to assemble before the piecing is done. 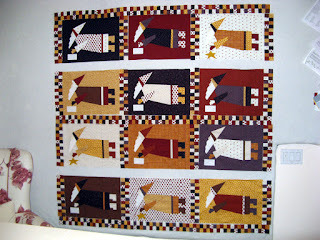 At lunchtime yesterday the white background santas had their beards appliqued in place. Today the purple! The signs will say "Believe". Not certain how I will accomplish this. 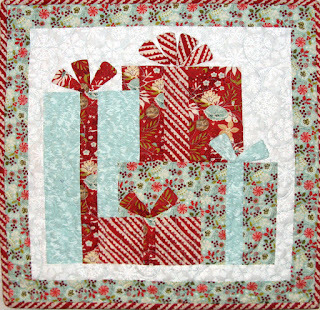 My new sewing machine has an alphabet so I am thinking about trying it out. If that fails embroidery will ensue. 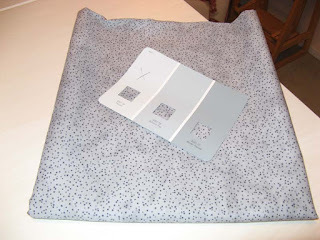 Certainly going to give the Pfaff a try first. 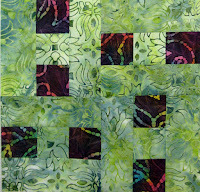 The strips on the right are my addition to the Sunshine November BOM created by Karen. The green was provided. Below is a sample of what I'll be stitching. 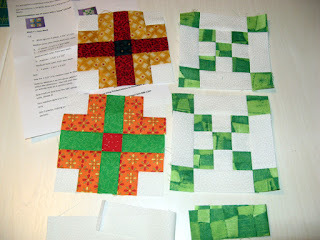 I am to make two blocks. Happy that it is HUMP DAY! Katchaklaus is front and center on my Design Wall today. Over the weekend all the santas were stitched. 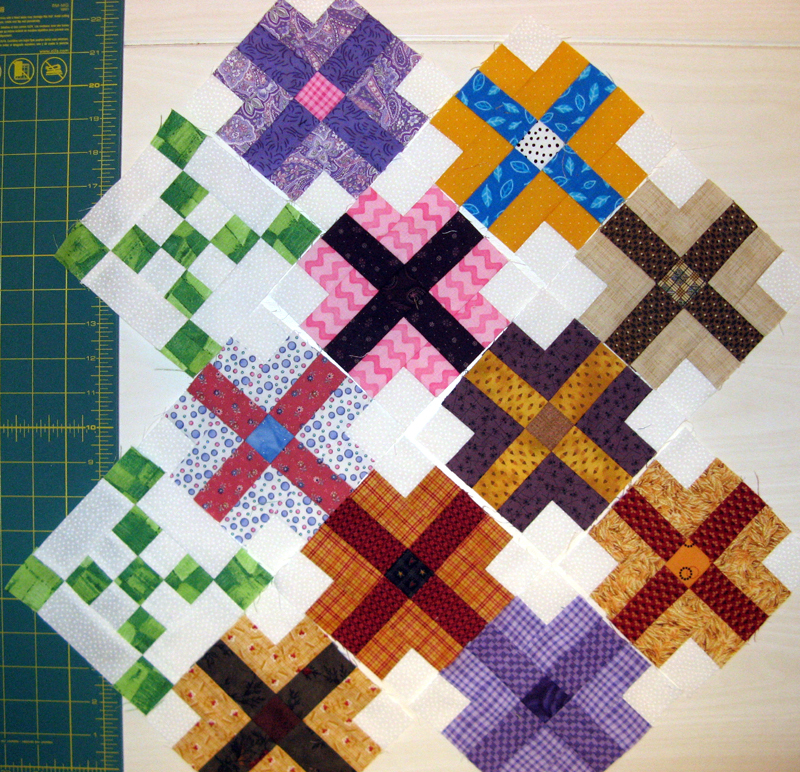 Next came the trimming of each block. 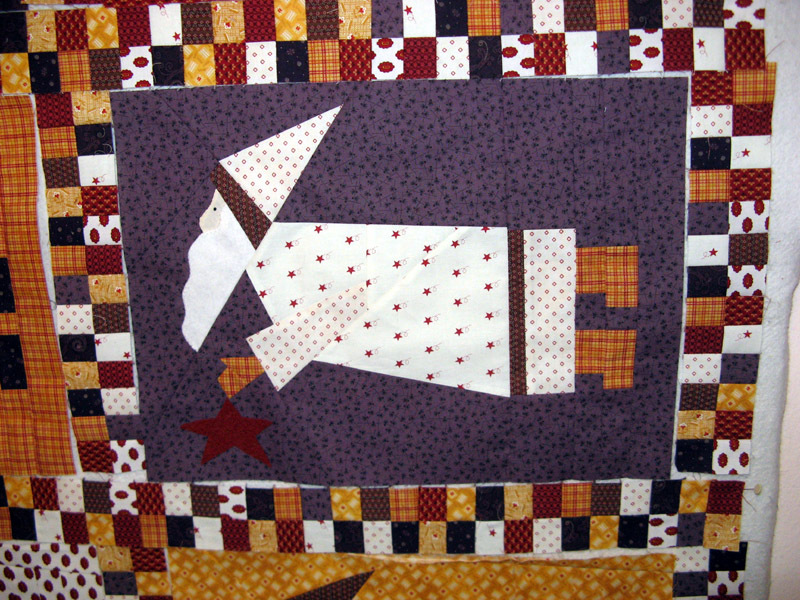 I worked on the stars and the signs until I ran out of white felted wool. The block on the lower right corner still needs a sign. A run to Country Loft in La Mesa is in my future. Next came the checkerboard sashing. 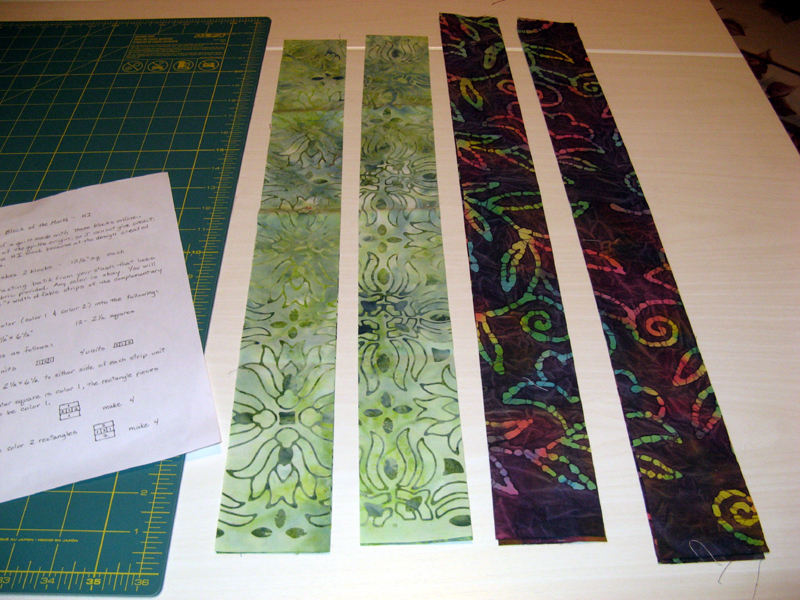 It will go together quick once I have it all cut into the 1.5" sections. 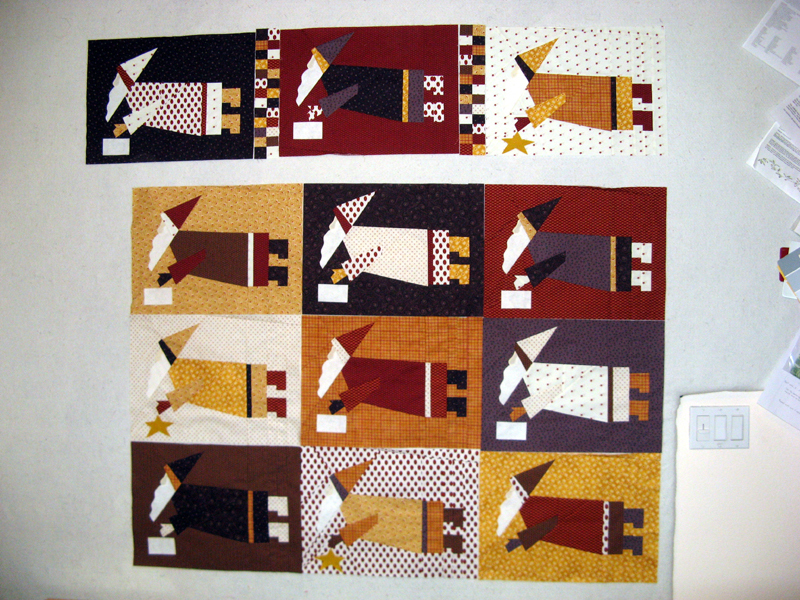 The first photo shows two of the units stitched. We had some rain today; not much but anything is good in our area. Hope you have a wonderful week. 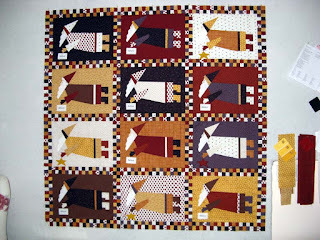 See more projects through Judy's links at Patchwork Times. Now I have it right! 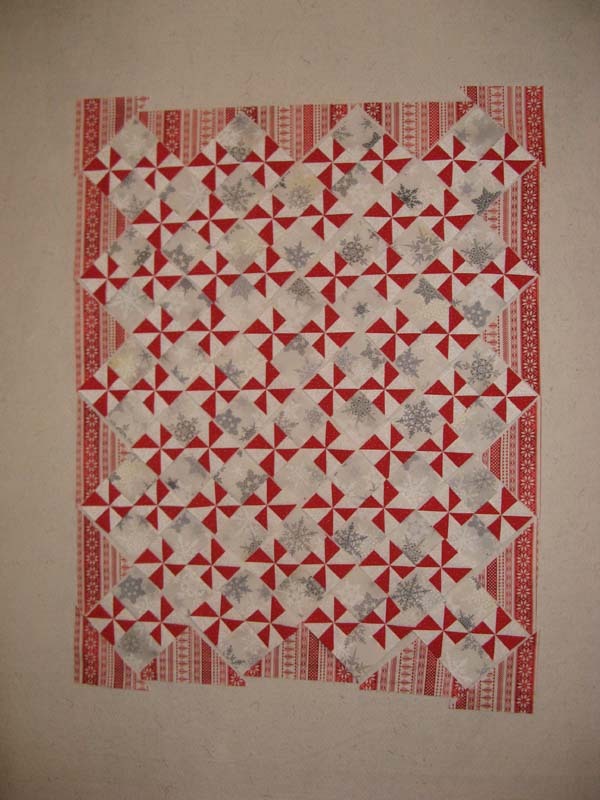 I mentioned that several of the blocks might have been turned wrong when I stitched up the top. 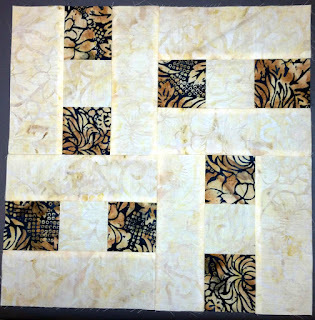 I was right, six blocks had the four patch going the wrong direction. So happy to find out before it was quilted. 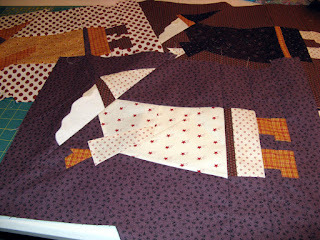 Back to Kerry's Quilting queue it will go. Erica's Craft and Sewing Center in South Bend, IN had the fabrics I've been looking for for my Snowy Day project. It was on sale too! I mentioned seeing this project a few weeks ago. I had been on the hunt for something that would work, but not successful. 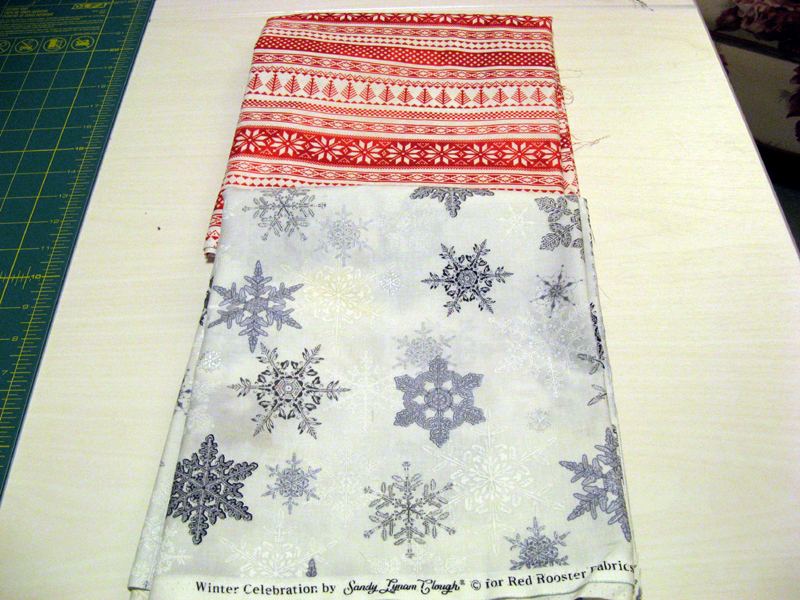 The fabrics arrived yesterday, so after stitching flying santas...snowflakes will be on my sewing table. 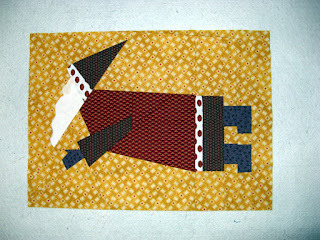 Today I'm working on flying santas. Check in tomorrow for my progress. 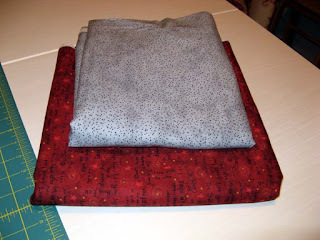 Hope you have time to sit and sew today. 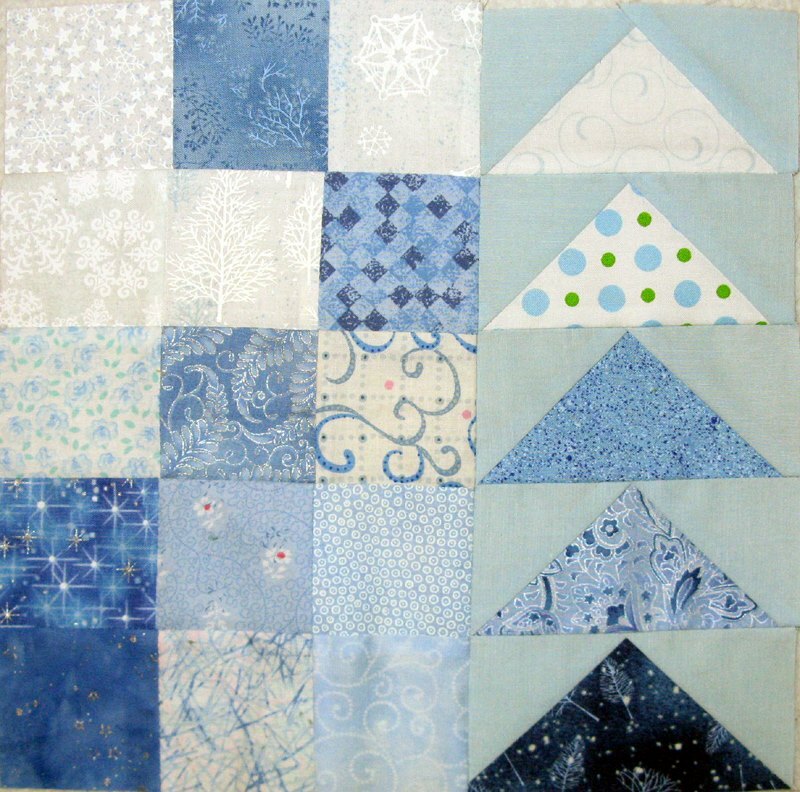 See other projects through Patchwork Times. 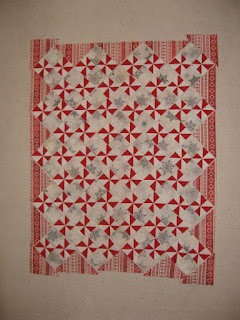 Nothing to share new on my Design Wall today. I finished the binding, sleeve, and label on Koronado while watching Sunday football games. 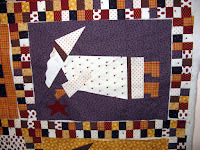 I also stitched down the sleeves of three other quilts as well as their labels. 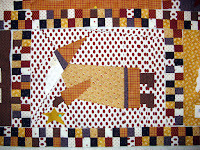 Sunshine Quilt Guild meets on Tuesday so I have been getting my finished projects together for sharing. 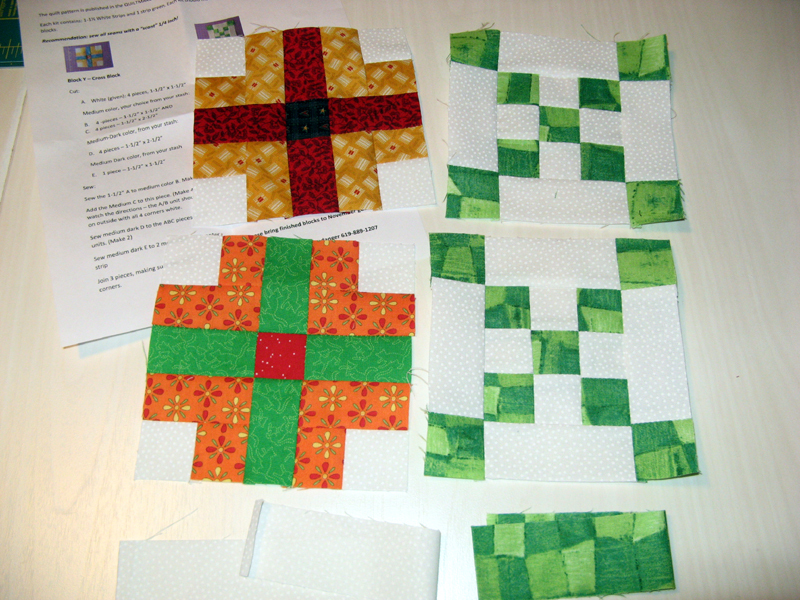 I have the four blocks for the opportunity quilt done along with one extra. The November BOM is done too. 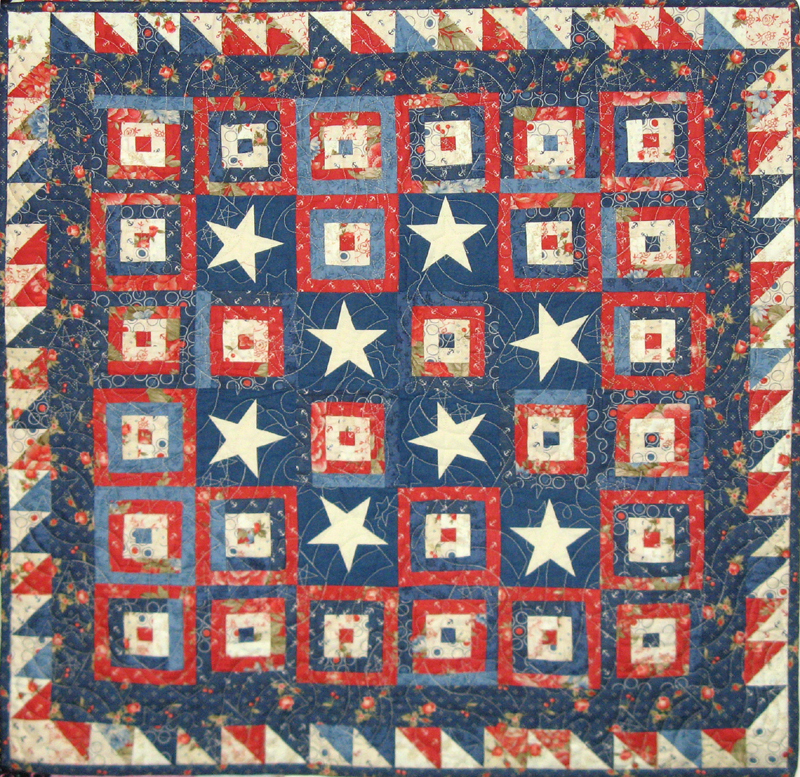 Have a great week and check out more projects through the links today at Patchwork Times. Saturday I picked up Chapter 11 of A Prairie Gathering from Country Loft in La Mesa. Only one more Chapter to get before I'll have the entire kit. 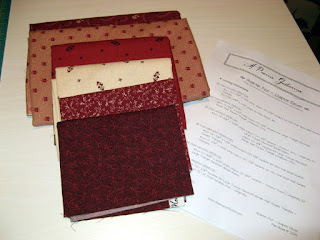 Kerry and I plan to stitch our chapters one a month starting in January. 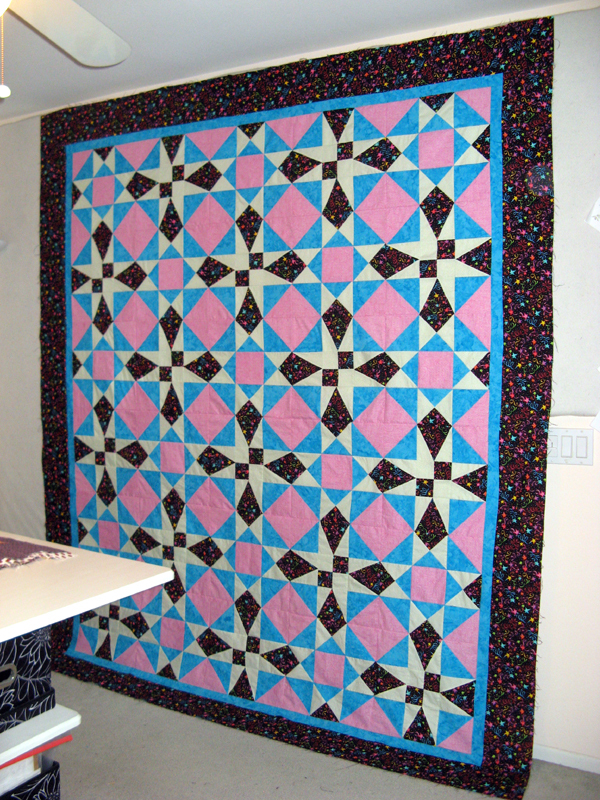 A finish for my Mom's UFO was Friday. Saturday I picked up a back and batting for it. 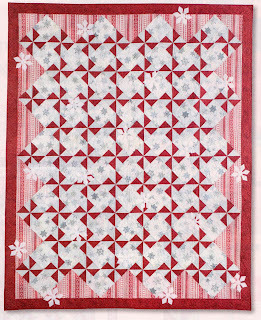 Pink thread for the quilting and a quilt stitch design that looks real close to the design in the focus fabric. The pink thread will really standout against the white back. 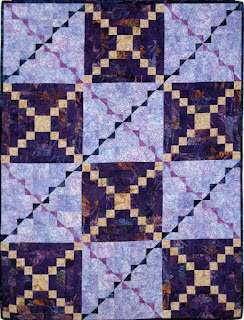 Can you see the Storm at Sea pattern created by the block placement. Wonder if I should have had all the center four-patches going in the same direction... May have to hold the quilting until I figure this out. Friday this quilty gift arrived from Aunt Marti. She picks a random winner for participation in the UFO monthly parade. I won in October. The parade is the first day of each month. 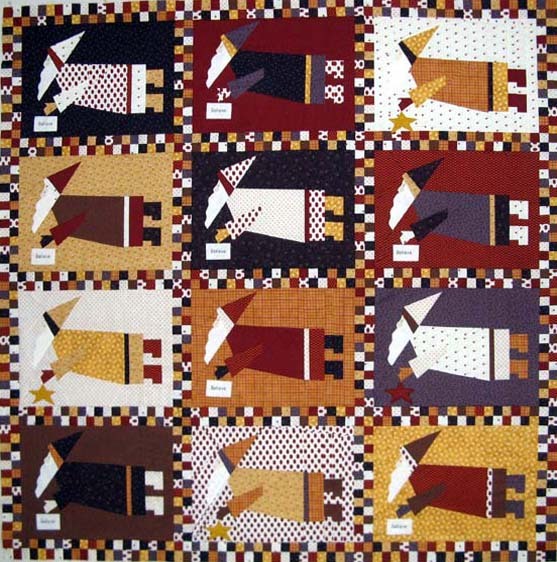 If you have time December 1st is a day to look at 52quilts.com. My stats change with the addition of Chapter 11. 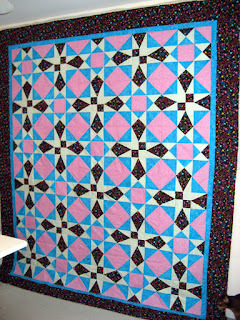 No change for my Mom's UFO since I didn't purchase the fabric. Now my design wall is barren! Time to get back to my flying santas. 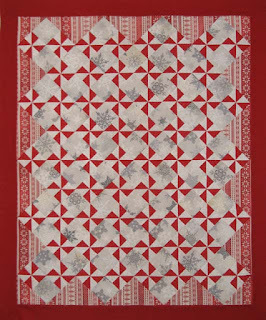 This is the project that comes together with Bonnie Sue's November BOM offering at Sunshine Quilt Guild. Oh my gosh, I love it! My block is one of the blue ones similar to the center block. So far I've come up with a pretty good range of blues and whites. I'll be digging through more stash to see if I can find a few more. 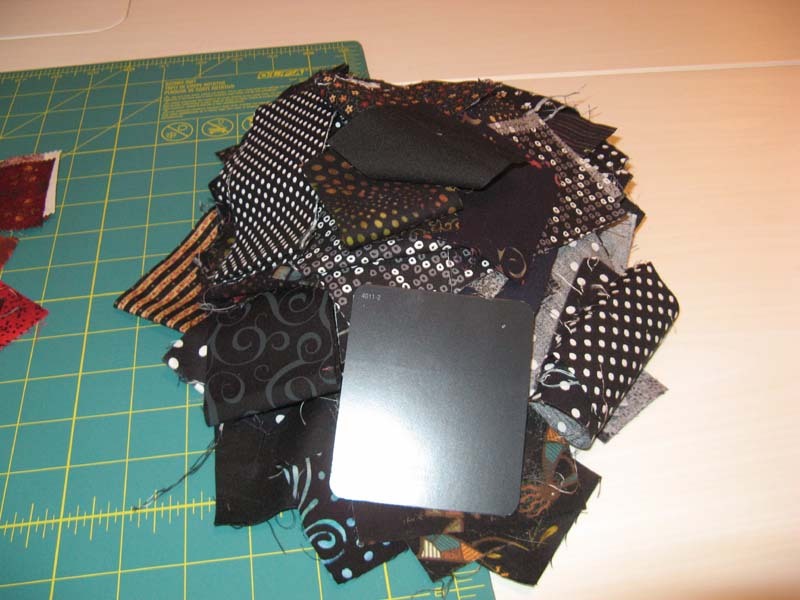 I'd be real happy to have all of the fabrics I add different than each other. I hope my recent luck extends through next Tuesday! 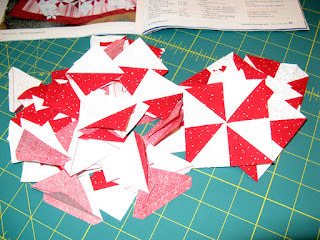 I'll be assembling my block later tonight. 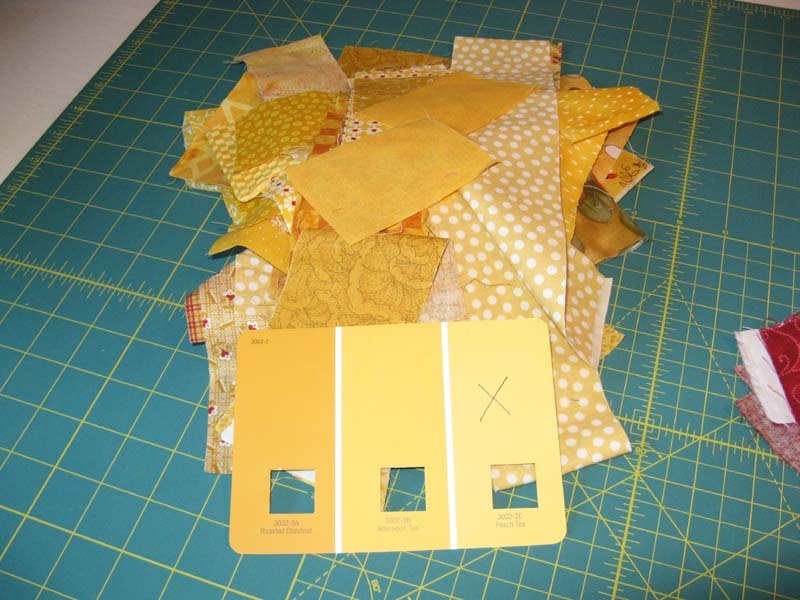 Tuesday night I selected the fabrics for my Sunshine Quilt Guild Opportunity Quilt project. The green (on the right) and white were provided. 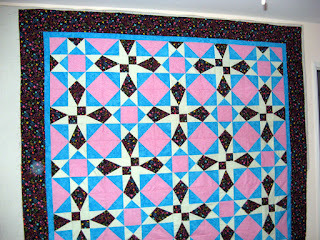 Members added the rest of the fabrics to complete the two blocks on the right. 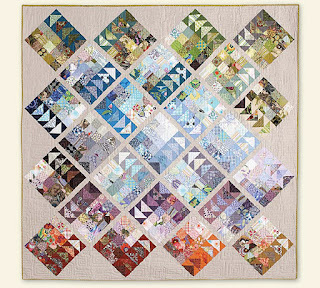 This is Bonnie Hunter's Garden Party design that was featured in Quiltmaker Magazine earlier this year. 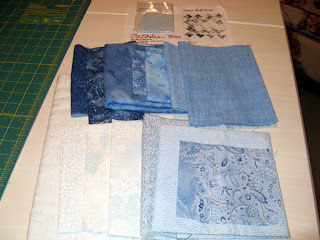 Sunday instead of machine sewing...I stitched the binding around each of these projects. All of them are 2015 UFOs. 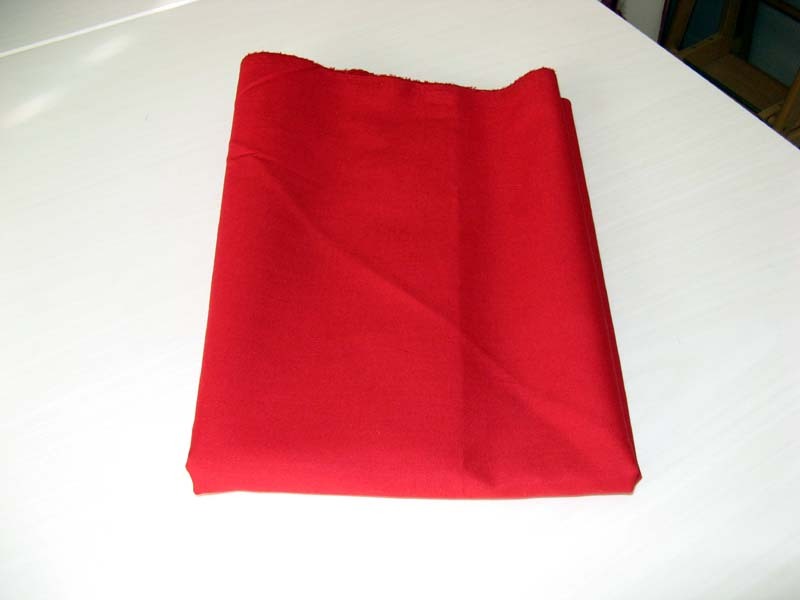 I still have the sleeves and labels to put on. 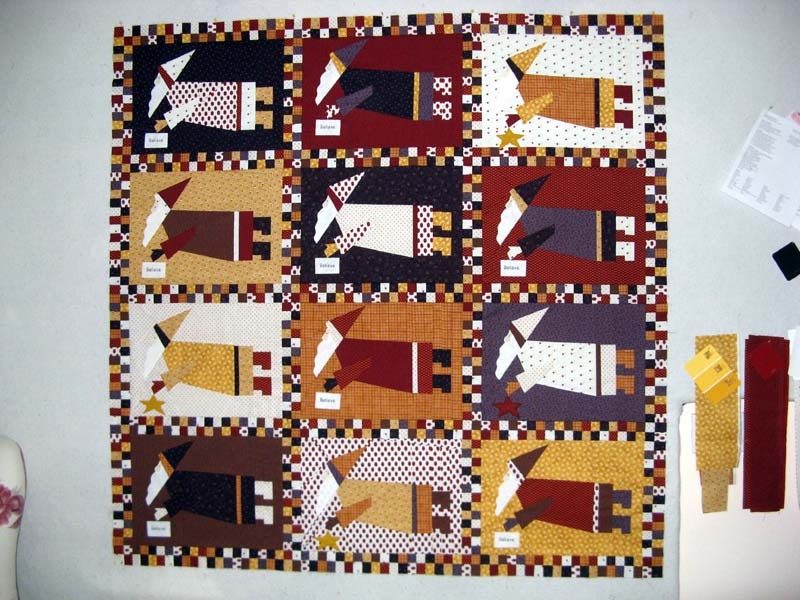 This weekend I was twice the quilty winner. My first surprise came on Friday. 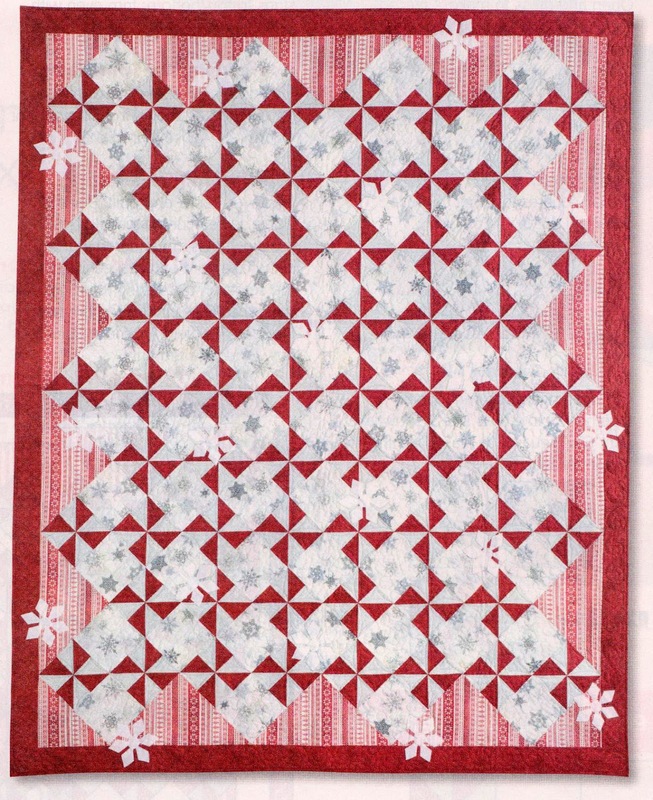 I won a quilt! During my last visit to my parents in Maryland a stop to visit a patient at MedStar St. Mary's Hospital found me in their gift shop. 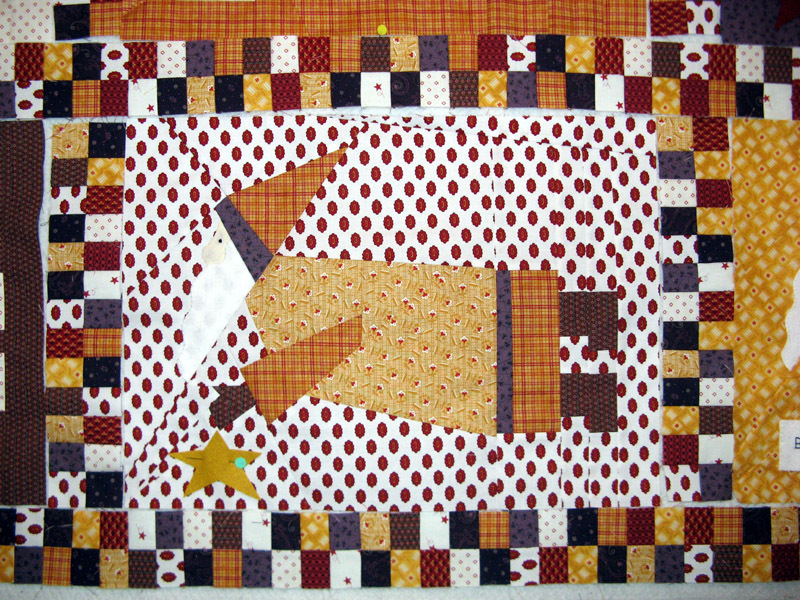 A quilt was being raffled to support the hospice efforts in the area. 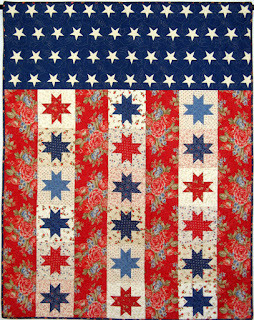 When I can I support fundraisers especially when the prize is a quilt. 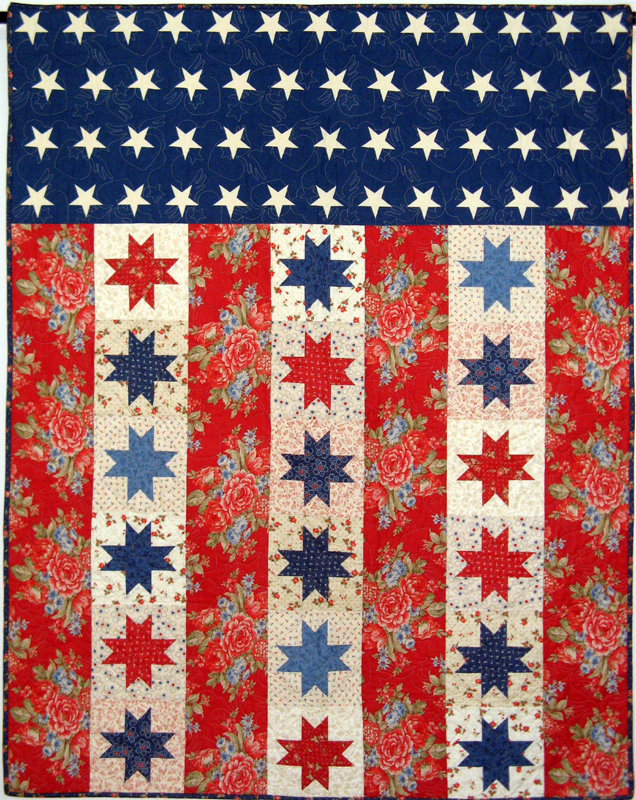 This is the quilt I won and a close-up of the detail. 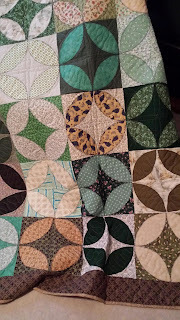 It is all pieced except perhaps the detail around the oval sections and the binding. 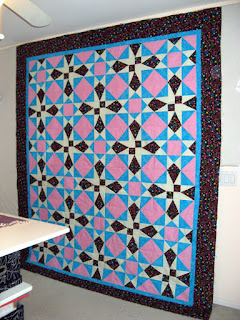 The quilt is in Maryland at my parents waiting for what's next. 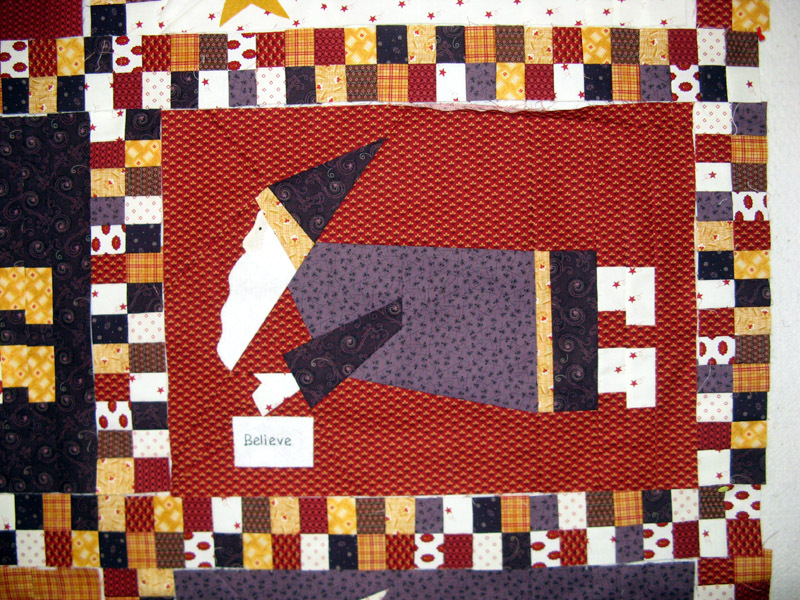 The second win was for participation in the 2015 UFO Parade that is hosted by Aunt Marti of 52Quilts.com. 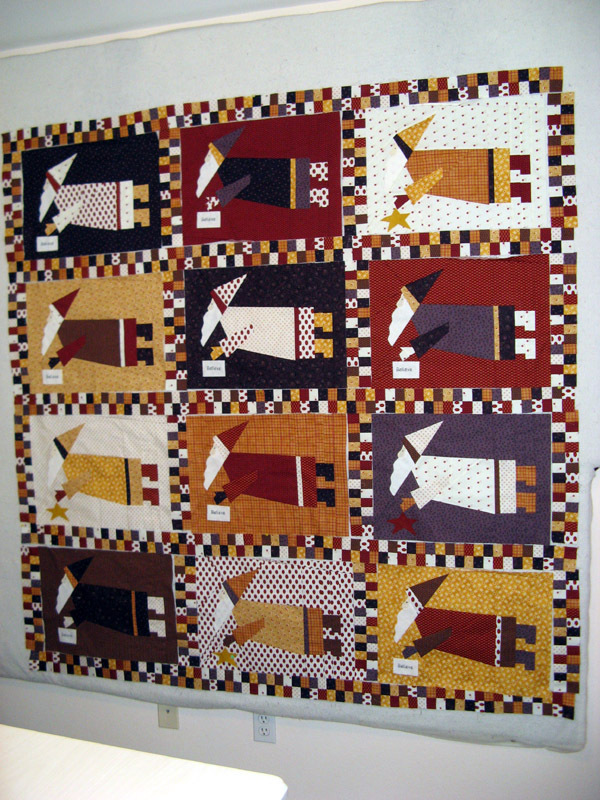 If you haven't seen October's Parade you should take a look at the sewing that's been done during the month by the talents of Aunt Marti's followers. I'm not sure what I have coming in the mail from Colorado, but Aunt Marti tells me I'll be pleased! 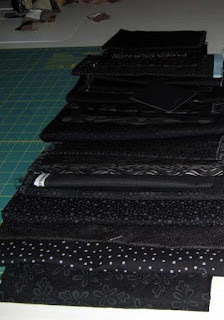 Oh by the way my last two UFOs are already done...since the beginning of October I've been working on the projects that won't have a chance to make the 2016 UFO list =^.^=. 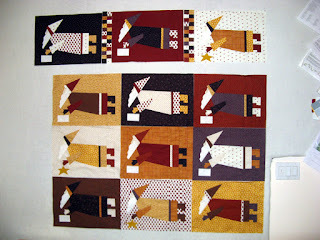 I'm planning to get back to my Design Wall to finish up my Mom's UFO this week. Hope you are working on something fun! 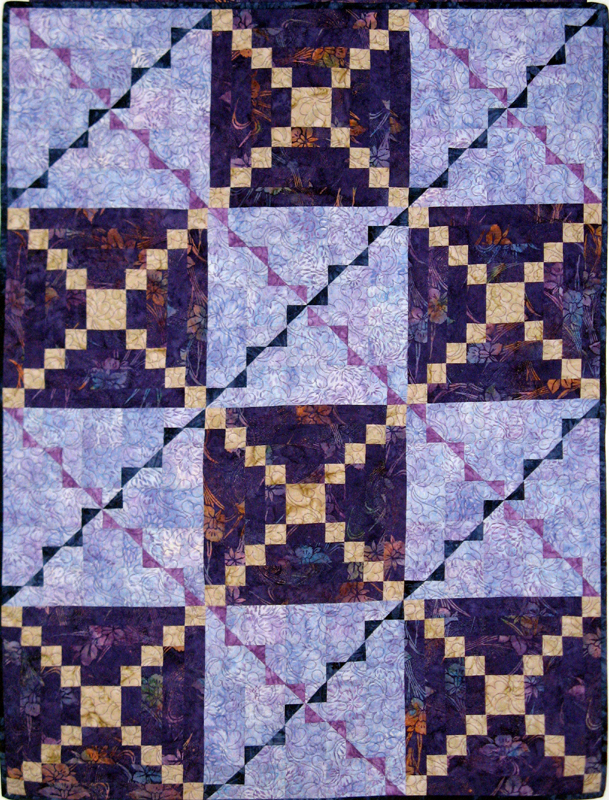 Check out more projects through the links at Patchwork Times. Enjoy your week.